In Acts 2:40-47, we have the first authoritative description we have of the first Christians. They not only describe what happened but help us examine ourselves. Amidst the cultural confusion about what Christianity actually is, here we get insight into true Christianity. True Christianity is God-initiated, Jesus-centered, and person-changing. 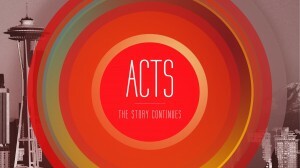 We are several weeks into our new series through the book of Acts. We’re looking at what Christianity is, what the church is and what God’s purposes in the world are. Today we move into an important section (Acts 2:42-47) that addresses these issues. So far, Jesus commissioned his disciples (1:8), he ascended into heaven (1:9), the disciples returned to Jerusalem to await the Holy Spirit (1:12), Judas is replaced by Matthias (1:26), the Holy Spirit arrives on the day of Pentecost (2:1-4), the 120 supernaturally speak of the “mighty works” of God in the languages of those present (2:5-13) and Peter stands up to preach on the historical facts of Jesus’ life, death, resurrection and ascension (2:14-41). Miraculously, 3,000 believe (2:41). #1 Academic Christianity. This misconception of Christianity is seen more as a hobby defined by reading, studying, learning, debating, and arguing. Little depth. #2 Emotional Christianity. What ultimately matters is who you feel and how deeply you feel what you feel. The goal every week is to work up the emotions and re-create a Pentecost like experience. #3 Good-Works Christianity. This is one of the most common misconceptions of Christianity in Seattle. This false form of Christianity is primarily defined by good works. It asks, “Are you improving humanity? Involved politically?” The mind and emotions matter little if you’re not doing anything. #4 Religious Christianity. The is one of the other most common misconceptions of Christianity in Seattle. This form of Christianity is seen as very negative, prohibitive, and restrictive. It is characterized by a sense of duty and religious activity. There is little joy, except when you are in the car driving home. It is important to know that not all Christianities are the real thing, particularly in Seattle. This is a tragedy in light of the description of the early church here (vs46-47). Could there be a greater contrast? This is Christianity. What our city needs, what we need, is this Christianity. Throughout church history, every time of reformation and revival the church is living in the way described in these verses. This is how Christians are to live. So, what is true Christianity? Lets look at three things from the text. TRUE Christianity is something that God does, not something we “pick up”. Acts 2:47 “the Lord added to their number” Who? The Lord. Mt 11:28 “Come to me, all who labor and are heavy laden, and I will give you rest…. Q: How do I know if God has saved me or if I’m just picking up Christianity like a hobby? What follows are not requirements to be saved, but indicators that we are. Do you love Jesus? Do you desire to worship, follow and obey him? Any practical effect on your life? Do you love the Bible? Enjoy reading, getting nourishment there? Do you care? Do you enjoy living out and sharing gospel? Do you care if someone is lost? Do you love Christians? How does that practically demonstrate itself? Part of a church? Serving? Giving? TRUE Christianity is central, not peripheral. (Acts 2:38,42) The second observation we can make of these first Christians is that their Christianity was central, not peripheral, to their lives. They “devoted themselves to…teaching…fellowship… breaking of bread…prayers.” It is not just that they started to do new things, rather there was a radical reorientation of their lives around a new axis, Jesus Christ. We see this also in their willingness to get baptized as a public proclamation of their faith (a proclamation that would likely lead to persecution, imprisonment or potentially death). Jesus became the primary controlling factor in their lives. He was everything. This is entirely different that the popularly held view today that Jesus is something we add to our lives without actually changing how our lives look – except for the fact that we have plans on Sunday morning. The popular view of Christianity has Jesus on the periphery, not the center. Jesus is an addition, not the vital axis. But, Christianity on the periphery is not true Christianity. Does Jesus influence where you live, where you work, how you steward your money, serve other people? Does Jesus influence how you make decisions? Who you are in community with? Are you involved and connected to a local body of believers? TRUE Christianity involves the entire person, not part of a person. (Acts 2:41-46) The third aspect of true Christianity we see reflected here is that it involves the entire person: mind, heart and will. The entire self is set free from sin and captivated by a new Person. They “received” and “believed” it with their minds (2:41,44). Christianity doesn’t bypass the mind. Christians know why they are Christians. The mind is engaged and involved. Their hearts were also affected. We’re told they had “glad and generous hearts” (2:43,46). Christianity is true happiness. Jesus is the one person in the whole world that can make all people truly happy. Their wills were also moved. They “devoted themselves to…teaching…fellowship..breaking of bread…and prayers” (2:42) and did so “day by day” (2:46) having “all things in common” (2:44). Their Christianity moved them to action, to good works, to sacrificial generosity. The mind understands, the heart is moved and the will acts. That is true Christianity. Love for other believers in Christ. Love for the good news of Jesus. The question we are all forced to ask is “Am I a Christian?” This is not asking “Are you doing a lot of good things?” or “Are you a church member?” or “Were your parents Christians?” or “Have you been baptized?” or “Were you born in a Christian culture?” No. What this is asking is whether your life reflects the life of those described at the end of the second chapter. Has God picked you up or are you trying to pick God up? Is Jesus the center or at the periphery? Are you living out of a caricature of Christianity or are you living the real thing? True Christianity is filled with life, power, joy, and abandon because it is the action of God. He sends the Holy Spirit into the church to bring about God’s purposes in the world. He invites us into those purposes by turning from our sin and turning, instead, to him by faith today – and every day. What we need, what our city needs, is true Christianity.